Tourism promotion with air and hotel fare discount to stimulate foreign tourists’ visit in Korea. Various experience events and program with the theme of cultural cuisine. Foreign tourists visiting Korea will get the chance to experience the country’s annual festival of shopping, tourism, and culture dubbed “Korea Grand Sale 2019“. Visit Korea Committee will host the annual festival of shopping, tourism, and culture from January 17 to February 28 in order to promote foreign tourists to visit Korea and increase their expenditure throughout the winter. 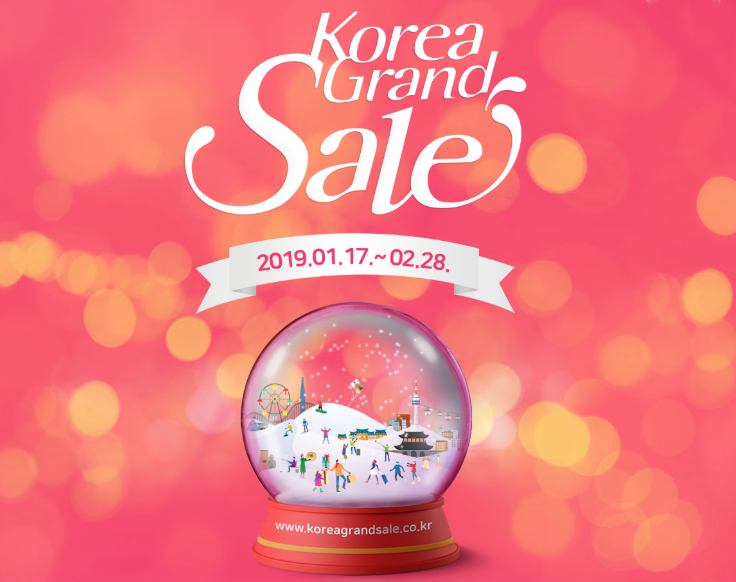 Throughout the 43 days of the event, Korea Grand Sale will provide grand scale discount promotion including air/hotel fares so that this event will be stabilized as a representative winter tourism event in Korea. Jin Air up to 85% discount, JEJU Air up to 80% discount, VIVALDI PARK and DAEMYUNG RESORT 60-75% discount, RAMADA encore HOTEL HAEUNDAE 55-70% discount, and Best Western Premier Seoul Garden Hotel 50% discount will be offered. Also, bus tour package for foreign tourists will also provide great deal to promote more active tourist involvement in provincial areas: K-Travel Bus provides buy-one-get-one-free chance for 7 routes (Daegu, Gangwon, Kyungbuk, Junnam, Chungchung, Changwon city, Ganghwa town). Korea Grand Sale 2019 is designed to increase the cultural experience of foreign visitors by selecting the main theme of the event as “taste of Korea” with various events and promotion. Over 60 hotel food restaurants all over the country will participate Korea Grand Tasting – Special Taste of Korea in Hotel to introduce Korean food to many foreign visitors, as well as invitation events that the customers can select the hotel restaurant they want to visit. “Korea Grand Sale is not only a simple tourism promotion for shopping experiences in Korea but it also features various experiences of Korean culture and food,” Chairman of Visit Korea Committee Kyungah Han said.